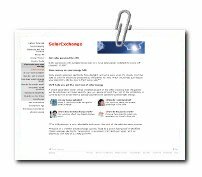 When it comes to all the solar offers available we get most interest from people with E.on's SolarExchange (They write Solar Exchange as a single word) free solar offer. They are probably popular due to the fact that E.on is a massive brand name energy company in the UK and people often feel comfortable dealing with big names even when other smaller companies do just as good or a better job or have a better offer. Their SolarExchange scheme is not exactly free as they charge a non-refundable administration fee of £99. This is probably to offset the cost of the survey as I'd imagine there are many homes that do not meet the criteria for free solar. If you wee considering using E.on you should be aware that once you have paid the £99 fee it does not guarantee that you will qualify for free solar panels and you will not get you money back. I make this point in answering the question; Are Eon solar panels free with their SolarExchange scheme? in more detail. Under the SolarExchange scheme E.on offer systems up to 3.89kW and they claim this will save you about a third off you electricity bill. This will work out between £100 and £180 a year at current prices. The largest system they install uses 22 panels and the smallest only 12 to suit smaller roofs. One of the disadvantages of the free solar offers from the energy companies is that you have to be a customer which means for those not already with them would have to switch. Also the do not install a system if you have a prepayment meter or you are not up to date with your bills. Also bear in mind there is an additional £210 cost to cover the additional scaffolding needed if you have a conservatory. When do I get ownership of the panels? After the 25 year contract ends and ownership of the panels passes to you. E.on Energy is a national company that can install solar panels over most of the UK. There are some obvious benefits with using a brand name energy company over a smaller company. They tend to have more established systems so you will generally know what to expect. They have a history and people generally trust well established names. In comparison with other free installers they do not have the best deal as they have a non-refundable admin fee which no other installer charges. This means that in theory you may not actually save any money in the first year if you only have the smallest system they offer. For the fact that you need to be an existing customer and due to the fee I would not choose E.on to install free solar panels. There are no additional benefits of choosing them over the many other deals already out there. Saying that the appeal of being a well known company will attract many customers who may be concerned about going with one of the smaller less well know firms which seems strange as you are getting it all for free.